I’m standing on an empty beach. One of the cool things about Cambodia, is that unlike Thailand, there are still many quiet, natural, romantic beaches that are relatively untouched. This one east of Sihanoukville, is known as Otres Beach. Gentle waves lap at the sands. Palm trees sway in the wind. Cumulus clouds look like white mountains on the horizon. A few small, tropical islands rise from the waters offshore in the distance. One of the islands far to the south of me is Koh Tang. This island isn't well known to Americans, but it should be. On that remote island off the coast, occurred the very last battle of the Vietnam War. On May 12th, 1975, after Saigon and Phnom Penh had already fallen to the communists officially ending their wars, the Khmer Rouge took the conflict a step further. Using US made swift boats captured from the Cambodian Navy, they turned pirate. 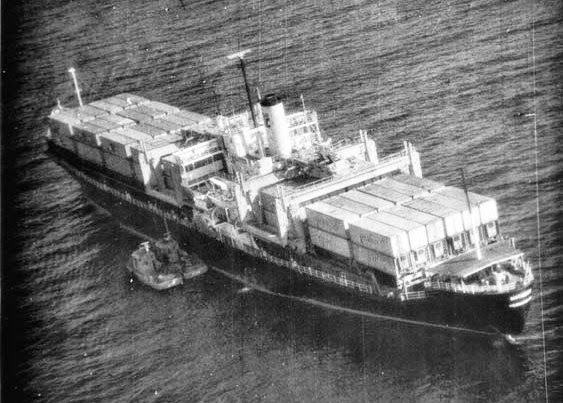 Heading far out to sea in international waters, they captured the SS Mayaguez, a passing American container ship headed for Thailand. Caught unawares, the US military quickly planned a rescue. The Khmer Rouge had anchored the Mayaguez off of Koh Tang Island, so the main assault focused there. Four days after the ship's capture, the Americans launched a raid to rescue the captured sailors. What they didn't know, was that the 39 crew members weren't even on Koh Tang. In fact, they had been sent to Sihanoukville, and had already been released by boat just before the mission started. The team also lacked the right intelligence on Koh Tang. What they didn’t know, was that the Khmer Rouge based there were already well armed and ready for fighting. They weren't expecting a raid from the Americans though. They were paranoid about a seaborne attack from the Vietnamese, whom the Khmer Rouge also hated. 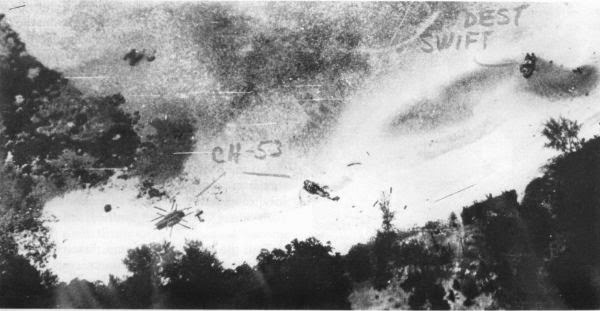 As the attack began, navy jets from the USS Coral Sea struck targets around Sihanoukville. These included the port's warehouses, a nearby airfield, train yard, refinery, and a small nearby naval base. At Koh Tang Island, US Marines and the US Navy swooped in. When they boarded the Mayaguez, they found an empty ship! In the air the US helicopters faced unexpectedly fierce ground fire from the Khmer Rouge. It's unknown how many Khmer Rouge died in the battle, but 40 American soldiers lost their lives. In the chaotic aftermath, two live US Marines were left behind on Koh Tang. What happened to them is unknown. Their bodies were never found, and they are still listed as missing in action (MIA). As the captured sailors from the Mayaguez had already been released, the rescue operation had been a disaster. They had retrieved the captured ship, but at a great cost in human lives. Since this was America’s last battle of the Vietnam War era, I would like to go out to Koh Tang myself to see the island, but it’s not to be. Otres beach is as close as I’m going to get to Koh Tang. Recently, an American search team did manage to identify some bones that were found on Koh Tang. After lengthy DNA testing, the remains were identified as Private James Jacques, one of the missing Marines who died aboard a helicopter that had crashed into the sea. He was buried in 2013, in Colorado. Another American casualty of the Vietnam War was finally laid to rest. That isn't the end of the searches though, as there are still 53 US soldiers missing in action in Cambodia. Another Australian diver I met in Sihanoukville, actually worked with an American MIA search team. “I think they’re still looking for one helicopter,” she told me, referring to a chopper shot down over Koh Tang. The search team wanted to go to the island again, but they had faced the same weather problems that I do now. As I spoke with the Aussie, I learned that Koh Tang isn't the only place where the US is diving to look for the remains of missing soldiers in Cambodia. The Aussie says that she had been hired by a US team for an underwater search in a river towards the Vietnamese border, where another helicopter had crashed earlier in the war. She explained how the river had low visibility. Most of the fuselage was gone, but she did find metal plates, and other pieces that the search team said were helicopter parts. As we chatted more, I asked if she had found any bones, and she clammed up. Apparently there are still some secrets to be kept here, even though America's war in Southeast Asia has been over for decades.